Are you doubting about which platform to choose for the forms in your company? Nowadays, most of the companies had abandoned paper forms to start using a most efficient method, which allows you to save money and to work faster. 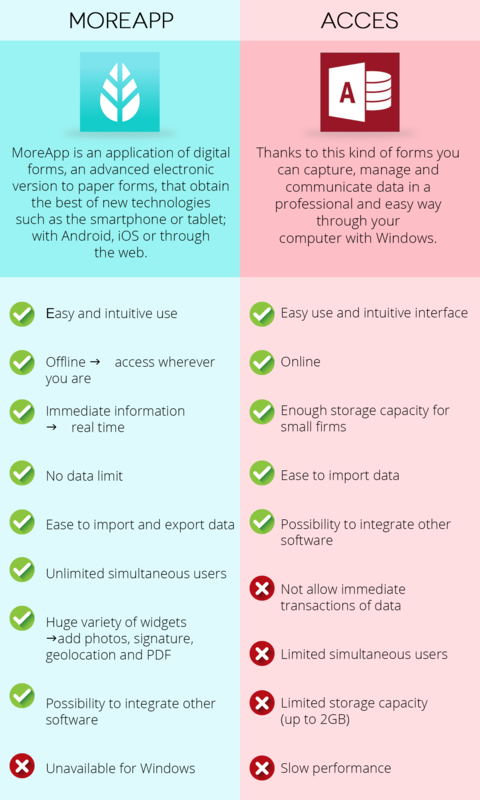 Here we offer you a comparison between digital forms and access forms. When computers appeared, some companies started their forms digitalization process, which initially were not really nice to read and not easy to fill in. Thanks to technology this has improved significantly, allowing to create forms of higher quality and much more easy to use. With all these technological achievements, firms have the possibility to use more than one platform to gather data with ease, such as digital forms and access forms. Here we offer you a comparison in order to make your decision easier so you can choose the best option for your case. To sum up, if you have some IT knowledge and you are looking for a platform in order to fill in simple forms through Windows with your computer connected to an access data base, and design is not your maximum priority, the best option are access forms. In contrast, if your company needs work orders, checklists, surveys, etc. and you need to work with offline forms where the information is modified in real time, the best will be a platform of digital forms such as MoreApp. Don't wait and create a free account now!